Leveraging our culture and empowering our people to become entrepreneurs and leaders of the business is at the core of our Strategic Plan. Achieving these goals is often predicated on providing meaningful suggestions. 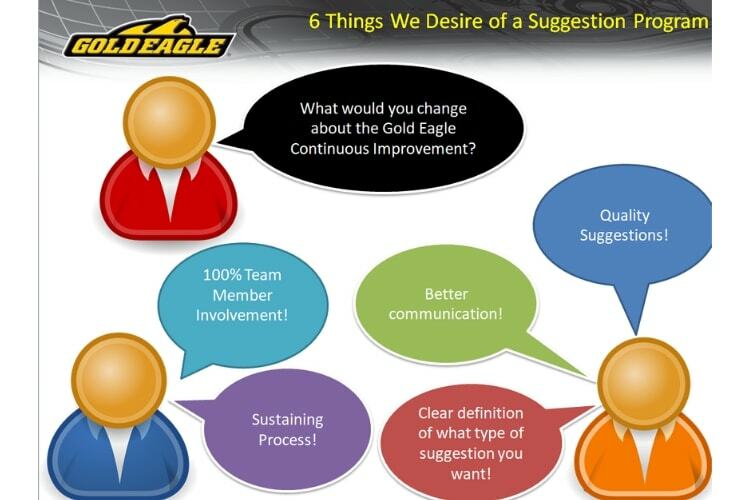 The Gold Eagle Suggestion Program is designed to empower all team members to be leaders and entrepreneurs by voicing ideas to make continuous improvements throughout the company. Ultimately, timely communication, quick suggestion turnaround, improved processes, and increased team member satisfaction are the measures of a successful Suggestion Program. Recently, we discovered several aspects of our Suggestion Program that needed improvement including a lack of communication and feedback; 39% of suggestions becoming stalled in a “parking lot” with no resolution; no clearly defined expectations and timeframes for suggestion submissions; and single resource dependency. To address these challenges, we conducted our first Culture Kaizen. 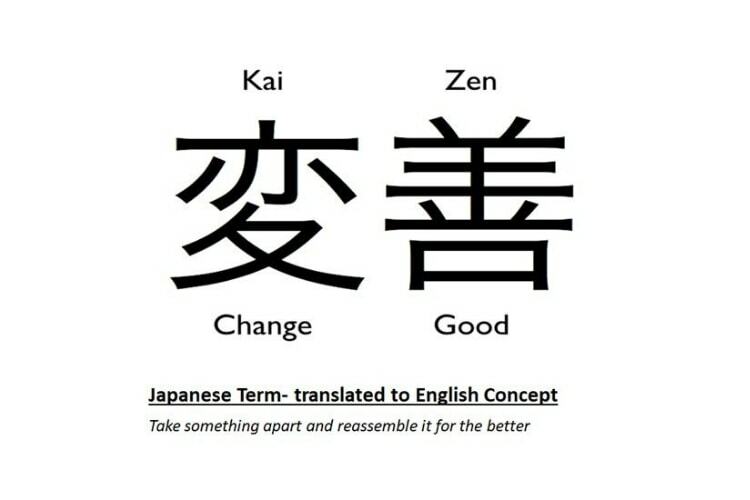 Kaizen is a process to empower people to improve a process or program. Incremental Kaizens address small changes that can be immediately implemented. Focused Kaizens foster significant improvements that address reoccurring opportunities through a root cause problem-solving methodology. 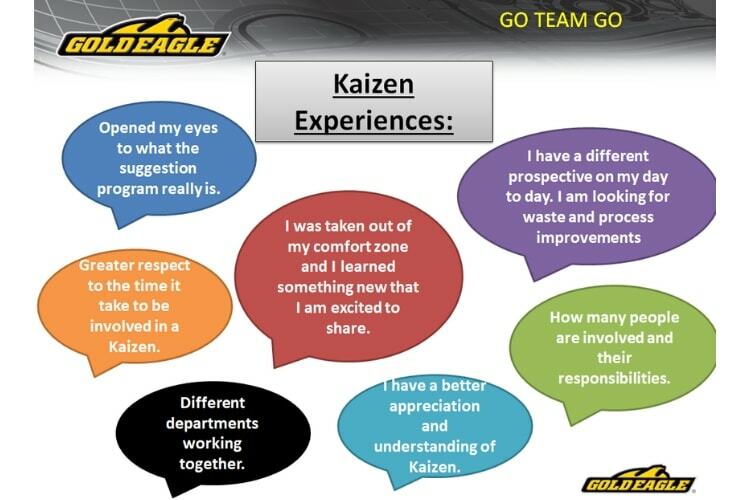 There are many benefits to Kaizen including empowering teams to make continuous improvements, implementing incremental changes that add value, identifying waste in a process and addressing significant reoccurring opportunities through a focused problem-solving methodology. During the course of one week in February 2019 a team of Culture Kaizen architects including Boby Jo Duve, Dawn Hickey, Anna Jachymiak, Bruce Kaufman, Dan Stewart and Laura Zamarron met to both learn and apply the principles of Kaizen to improve our Team Member Suggestion Program. 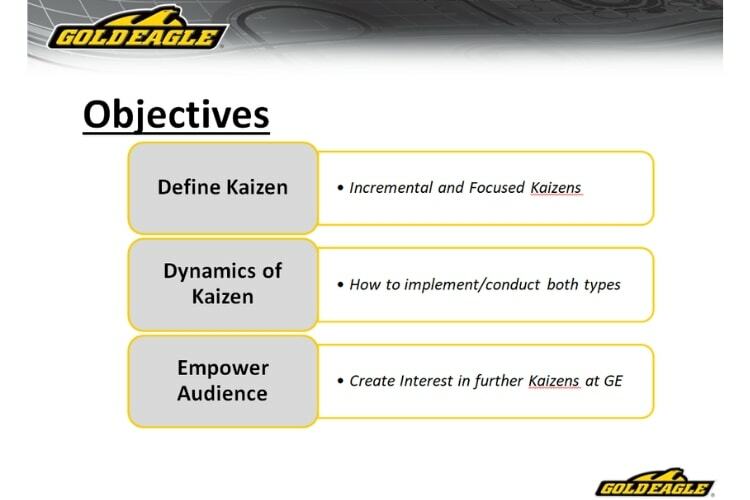 This Focused Kaizen was Gold Eagle’s first Culture Kaizen, with the goal of replicating the success of Kaizen events in the plant. 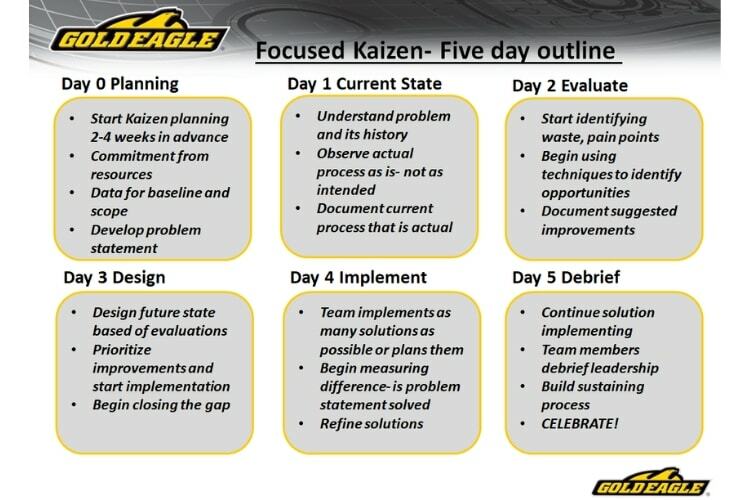 With Jesse Stutler, Tommy Mai and I serving as facilitators, the mission was for the team to learn the Kaizen process, analyze and deconstruct the current Suggestion Program and then build a new one. Each team member spent more than 20 hours over the course of one week to analyze every aspect of the Suggestion Program. Using tools such as process mapping and flow charts, the team broke down and discussed what was working and what was not. The team created goals for a new program to increase team member engagement; generate 75% team member involvement; capture 20 new quality suggestions per month; improve resource dependency; cut review time from four days to one; define expectations and timing; reduce parking lot items; and ensure decisions will be made. It is a testament to our commitment to continuously improve our culture that this first Kaizen is outside of a core manufacturing process focused on a culture issue, and took priority over topics such as cost savings, new product launch or minimal allowable variance. So what were the results of the Kaizen? How will we improve the Suggestion Program? How will we sustain it? Stay tuned for these answers, coming soon. Vanessa, your written presentation as well as the oral presentation that the team made several weeks ago were both impressive. The goals are meaningful, the process instructive and the education received by the team valuable. I look forward to seeing our improved suggestion process result in useful ideas. Thanks to all who participated in this effort.